This podcast for Why I Really Like This Book was for the miniseries on Thrillers for Gentlemen, looking at the kind of thriller or spy novel that was masculine without being brutal. These novels were written about men of a certain generation who understood the value of the gentleman’s club, and worked within its rules. These thrillers are tough, but with good manners. 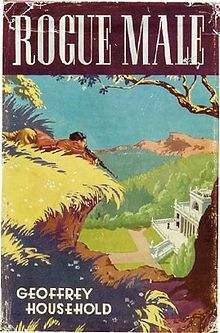 The classic hunted man thriller by Geoffrey Household, Rogue Male (1939) is about a man hunted like an animal, so he must behave like one to survive. This is a strange, anomalous novel, a one-off, though Household did write several other novels, with oddly familiar titles, like A Time to Kill and A Rough Shoot. 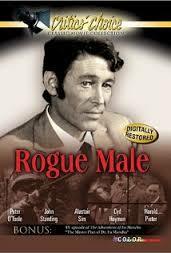 Rogue Male is set before the Second World War, and was published only just before war broke out. It’s really a novel about the impending threat to European civilisation by the apparently unstoppable forces of criminal fascism. 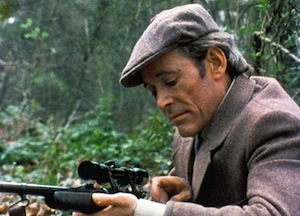 Peter O’Toole in the 1976 film. Here’s the plot: the narrator stalks a very important foreign politician, for what he keeps telling us is a private sporting challenge to himself. He gets into the grounds of the great leader’s estate, and almost manages to get into the firing position, but is bagged by security. Once the torture is over, he is dumped over a cliff, but, against the odds, he survives. He escapes the country, and goes to ground in London, and then into the Dorset countryside, because in London he killed one of the foreign agents who was following him, and now has the police and the rest of the agents on his trail. The remainder of the novel is about his fight for survival. I’ve missed out the most compelling parts of this story, which are all about how he survives. (I have to keep calling the narrator ‘he’, because one of the points of the plot is that ‘he’ is a very well-known Englishman from an ancient family, and so he cannot be named otherwise the government would be wrongly implicated. A name would inconvenience his friends and embarrass his clubs. ‘He’ is also a terribly expert hunter-gatherer type. He can and does use camouflage like a professional tracker. He’s a master of disguise. He knows and is expert with every gun ever invented, it seems, and assesses risk and endures physical discomfort like a machine. He is also infuriatingly reticent, which is of course another of the marks of a gentleman: one does not give away anything that might put others at risk. However, in a novel, the reticence of the narrator is misplaced, and can be downright irritating. Withholding information is all very well, if you intend to use this withholding to produce surprise, suspense, and a big reveal at the end. But withholding information because that’s what the character is like, can, and here does, spoil the story. He is controlled, uber-capable, and ungiving. I don’t warm to this unnamed narrator at all, and reread this book with increasing unwillingness. It IS a brilliant conceit, a highly entertaining and perfectly worked out structure and plot, and the descriptions of how one survives fiendish attempts at one’s life are terrific. I remembered those desperate situations, rather than the narrator, for over twenty years, before hunting down a copy of the book to read them again. The narrator is an unfriendly sort of cove I was not so pleased to meet again. Another reason for my unwillingness to embrace this novel is the suspense. Household manages to convey the sense that something really monumentally awful is going to happen, very soon, and he keeps this up all the way through. I don’t enjoy suspense: I would so much rather know what will happen so I can concentrate on the How and Why. 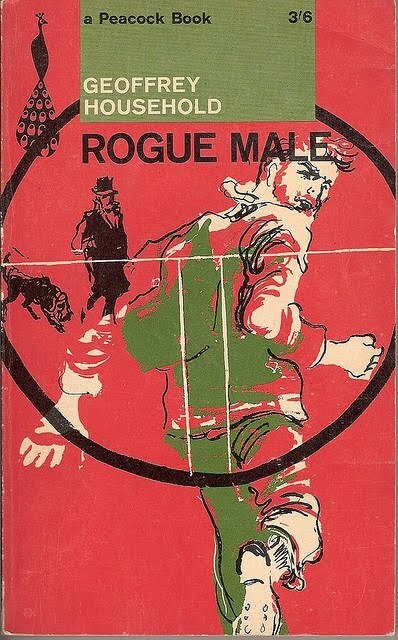 If the tension is unbearable I will only read the end pages first, but Rogue Male is not that unendurable. Instead, we have little reliefs, nicely paced throughout. The narrator survives the cliff-dumping episode, and we breathe again. He escapes by finding transport because he has apparently unlimited money and a perfect accent in the language of that country. He meets an unexpected couple of allies and does get out of the country. Despite being on home territory in London his stay there is truly unrestful, since he is followed everywhere he goes, and so he eventually engineers a nasty accident. The considerate behaviour of the Rogue Male narrator towards innocent bystanders is remarkable. His behaviour towards his last helper in the novel, whose life the narrator goes to astounding lengths to protect, is practically feudal. He does not give us the name of the woman in his life, and shows profound reluctance to mention her at all. He is aware that his enemy knows that he is safe for the evening because the narrator will not shoot the enemy in a room where he is playing chess with a small girl. Thus gentlemanly behaviour is predictable to those in the know (but not to the heavy-footed police). Another classic mark of the gentleman adventurer hero type is his complete comfort in the great outdoors. Household’s man has intimidating stalking and tracking expertise, but this is also highly enjoyable to read. We might, possibly, learn from the master how to emulate his slow snake-like wriggle through the undergrowth, or how to stay perfectly still and think of England when your protective haystack is being prodded with bayonets. When he builds his hideout, which takes days, he writes so proudly of the conveniences he has created, we are deeply impressed with his ingenuity and skill. We completely miss the point that he has built an overgrown rabbit burrow, with no mention of a toilet, although his remarks about the filth and smells he has to live in when, later, he is trapped there, perhaps do drive that point home, in a discreet prewar style. The point is, the narrator’s pride in his skill and cleverness in building the hide does not take comfort into account. This novel is for scouts and soldiers, and possibly armchair outdoorsmen who draw the line at getting down there in the mud with him. I don’t warm to this narrator, and he doesn’t seem to need my warming support, fictional invention though he is. When we read a thriller, or an adventure novel of any kind, the reader needs to feel wanted in some way, to feel that, were we able to step into the book, we could be useful in that adventure. Household’s narrator is so completely not in need of any help, so infuriatingly self-sufficient and a total survivor, that there is really no reason to read about his adventure at all. We admire, but do not love an expert, because admiration wears thin, unlike love. We would also so much rather root for an amateur, and this gentleman is absolutely not an amateur. 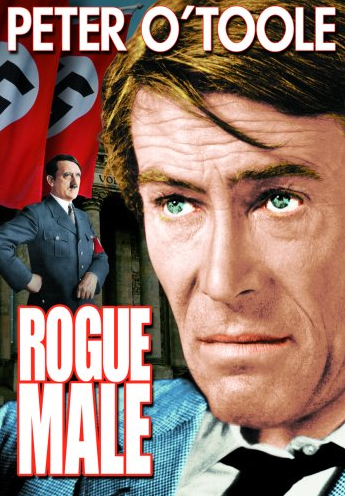 For all that, Rogue Male is a terrific read, even if it makes you want a long hot bath afterwards. I’ve read this story many times, and there is one passage I cannot fathom. After the hero leaves his solicitor’s office and goes to ground in Dorset, he orders books and receives a postcard in reply. The postcard says “the parrots paid the fisherman”. I’ve never been able to decipher that phrase. I assume the parrots are his pursuers. But who is the fisherman? *trots downstairs to reread passage in question* On pp57-58 in my old Penguin edition, when Hunted Man is interviewing his solicitors for the first time, he arranges to reward the ?Austrian fisherman who had helped him escape down river by sending him a bequest purportedly from the estate of an invented old lady who has left all her money to a parrots’ home, which the solicitor can disburse at his own discretion. Oh, now I get it! It confused me, because the next passage refers to the caravan he rented for the bicycle couple, so I assumed it was something sinister, when it was merely confirmation of payment to the fisherman. Thanks for clearing that up!